Waterloo – Water is at the centre of life and livelihoods in many Indigenous communities – yet many are experiencing major water-related changes and challenges. To help address those challenges, Wilfrid Laurier University scholars are working on two new research projects in partnership with Indigenous communities. Global Water Futures (GWF), the world’s largest university-led freshwater research program, has launched six new co-led projects across Canada to address urgent and growing water quality issues in Indigenous communities. Two of the projects are co-led by Laurier researchers and Indigenous partners. “Through these co-created and co-led projects, we are working with our Indigenous partners in an unprecedented way to develop solutions for critical community water security challenges, while trying to decolonialize water science,” said Professor John Pomeroy of the University of Saskatchewan, director of GWF, a Canada First Research Excellence Fund program. One of the projects, Matawa Water Futures: Developing an Indigenous-Informed Framework for Watershed Monitoring and Stewardship, is co-led by Terry Mitchell, a professor in Laurier’s School of International Policy and Governance, and Sarah Cockerton, manager of environmental programs for Four Rivers of Matawa First Nations Management (MFNM), a tribal council with nine member Ojibway and Cree First Nations in northern Ontario. The project, which seeks to help Matawa member First Nations maintain the safety of their water in the face of climate change and industrial development, is receiving $400,000 in GWF funding over three years. The five fly-in and four road-accessible communities of Matawa First Nations surround what is known as northern Ontario’s Ring of Fire, an area rich in minerals, notably chromite. There are numerous proposals in place for the development of mines and road access, which could affect the watershed and water quality. Mitchell has spent years working with Matawa member First Nations to conduct research on their experience with groups seeking consultation and consent for resource development within their traditional territories. The pre-existing research partnership, which includes having developed FPIC.info, the largest repository of online information on free, prior and informed consent (FPIC), is foundational to the Matawa Water Futures project. “Matawa Water Futures will braid together Indigenous traditional knowledge and western knowledge toward the development of robust, effective and contemporary monitoring and governance systems that will support Indigenous people’s ability to maintain their traditional role in water stewardship,” said Mitchell. Laurier members of the project team include Munkittrick, Associate Professor Alex Latta, Assistant Professor Miguel Sioui and Instructor Darren Thomas. Researchers from Lakehead and Laurentian universities are also involved, as are members of all nine Matawa First Nations. Another project, Water Knowledge Camps: Building Capacity for Cross-Cultural Water Knowledge, Research, and Environmental Monitoring, is co-led by Associate Professor Jennifer Baltzer, Canada Research Chair in Forests and Global Change and a member of Laurier’s Department of Biology, and Leon Andrew, a Shúhtaot'ı̨nę elder with the Tulı́t’a Dene Band and special advisor with Ɂehdzo Got’ı̨nę Gots’ę́ Nákedı – the Sahtú Renewable Resources Board, in the Sahtú Region of the Northwest Territories. The project involves holding on-the-land camps in three communities of the Sahtú Region – Tulit’a, Délı̨nę and Fort Good Hope – over three years. The project is receiving $330,000 in GWF funding. 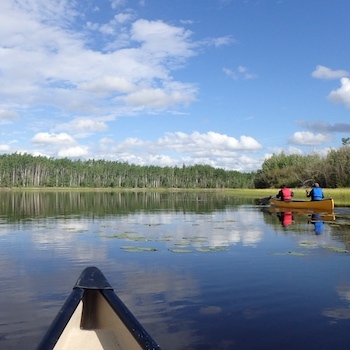 The week-long camps will bring together Northern Water Futures researchers, graduate students, and Sahtú elders and youth to focus on supporting the development of local and regional Indigenous Guardians programs. The camps will scientific presentations and demonstrations, coupled with formal and informal discussions of observed changes to the landscape and community needs for research and monitoring. “The camps will enhance research and its impacts in the Sahtú by giving university researchers a clearer picture of what communities know, need and want, as well as helping build mutual trust and a collaborative, cross-cultural approach to research,” said Andrew Spring, a Laurier adjunct professor and GWF research associate. The six new three-year projects – a $1.63-million investment – are in addition to 33 GWF projects already underway. Those involve a total of 15 universities and 172 partners, and include a $6.9-million investment into projects addressing water issues in Indigenous communities. About Global Water Futures: Global Water Futures is a seven-year, University of Saskatchewan-led research program funded in part by a $77.8-million grant from the Canada First Research Excellence Fund. The research goal is to transform the way communities, governments and industries in Canada and other cold regions of the world prepare for and manage increasing water-related threats. The program is developed and funded in part by three key partners – the University of Waterloo, McMaster University and Wilfrid Laurier University.